Located at 500 E Constitution Dr, Palatine, IL 60074. Nestled in the quiet suburbs of Palatine with glistening lakeside views, you will find Bourbon Square Apartments. This pet-friendly community of one, two and three bedroom apartments is located thirty minutes from Chicago’s north side and just blocks from the Deer Grove East Forest Preserve. Whether you sunbathe all afternoon on the pool deck or cruise into the city for a taste of the vibrant nightlife, these Palatine apartments will redefine your standard of serene living. At Bourbon Square Apartments, more is always better. Choose from one of four floor plans and admire the enormous layouts, ranch-style aesthetics and features of the highest craftsmanship. Organize your wardrobe with the abundant closet space or lounge on your patio while you gaze at the shimmering lake views included in select apartments. Within the community, you can enjoy diverse amenities sprinkled throughout the property. Host a video conference in the cyber café or plan a party in the community center. The surrounding neighborhood of Palatine is just as engaging with shopping and dining options accessible in a moment’s notice. With quick access to the US-12 Highway, navigating around town is easy as well. 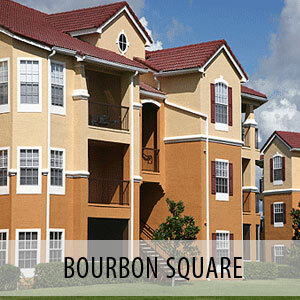 Choose Bourbon Square Apartments and find your perfect balance between big city living and ranch-style tranquility.